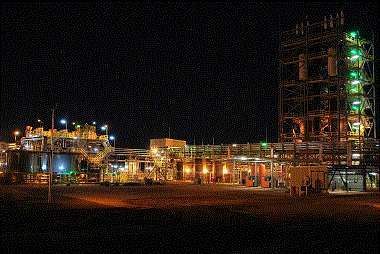 The Honeymoon uranium mine in South Australia has been mothballed due to low uranium prices and high operating costs. The project will be maintained so that operations can resume when financially viable. Uranium One said it had "impaired the Honeymoon project due to continuing difficulties in the production process and issues in attaining design capacity, combined with high mine operation costs." Operations at the in-situ leach (ISL) mine have now stopped and the mine will be put on a 'care and maintenance basis' pending improved uranium prices. The workforce at the mine will drop from the current 100 to about ten. Uranium One vice-president Kuzma Otto told ABC News, "We will transition down to the care and maintenance phase over a period of four or five months, depending on the consultation process with various stakeholders." He added, "This is not a closure phase, so the option to reopen is there. Some production problems during the commissioning process, as well as the yields from the well field being lower than we had anticipated, as well as uranium prices, played a contribution." Honeymoon, which has a capacity of up to 400 tonnes U3O8 (340 tU) per year, was expected to produce 275 tonnes U3O8 (233 tU) in 2012, at a cost of $47 per pound U3O8. This is around three times the average cost of Uranium One's production from Kazakhstan and compares badly to current uranium market spot market prices of $34.75 per pound, as reported by UxC. However, the mine's output was just 154.6 tonnes of U3O8 in 2012, with 120.2 tonnes produced between January and September this year. Uranium One is now wholly owned by AtomRedMetZoloto (ARMZ), part of Russia's state nuclear corporation Rosatom. "We cannot discount the dramatic fall in natural uranium prices, as a result of which over 50% of global uranium production is currently loss-making," ARMZ chairman and president of Uranium One Holding Vadim Zhivov told Reuters. "Given the unfavourable market environment, we have decided to freeze expansion projects both in Russia and abroad."